Get your finances under control now. Feel the peace of knowing your checkbook is balanced and in the black. Relish the bliss of paying your bills on time and savor the power when you have a savings and are in control of your spending. Pam Young created this book to help you in these difficult times. By marrying The GOOD Book:Get Out Of Debt with Flylady’s FACE™ Journal, in a very short time you will bring your finances under control AND have fun doing it. No more sleepless nights wondering how you are going to pay your bills. No more beating yourself up for unconscious spending, hiding receipts and credit card statements. No more needing approval from others. No more worrying when it comes to money. Pam’s fun-to-use tools and exercises will soon be helping you tackle your money problems. Learn the secret, thought-provoking weapon she used to free herself of $26,000 in credit card debt. You’ll instantly want to use it every day to stop sabotaging your good intentions toward your finances as well as other areas of your life. 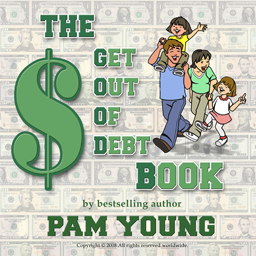 This humorous book was written to entertain you while Pam helps you grow into a financially mature adult. It is her prayer that you’ll be laughing all the way to the bank and to financial happiness while you bring your family right along. Chapter Eight, What About Your Appearance?